Mobil Unirex N3 greases are premium-quality, lithium-complex products suitable for high-temperature service in rolling-element bearings. These versatile greases can be used in a wide range of industrial applications and are particularly recommended for electric-motor lubrication. 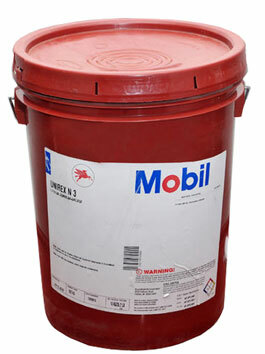 Mobil Unirex N3 is an NLGI No. 3 grade often used for special applications such as sealed-for-life electric motor bearings, vertically mounted bearings, and higher-speed applications. UNIREX N greases are not intended to be used under extreme pressure conditions where extra anti-welding properties are required. Mobil Supplier,Tamil Nadu, India, Mobil Ep2 Grease suppliers, Shc 100 Lithium Synthetic Grease, Unirex N2 Lithium Grease, Unirex N3 Lithium Grease, finolex Siemens, Schneider, 3D Sockets, Comet, Woer, Giantlok, Kheraj, JIGO, Sterling Cable Glands, Porcelain Fuse Carriers. Copyright 2016 Nivash Electric - All rights reserved.